I call Moritz Bracht of De Valk in Antibes for more news on the recent sale of Benetti's 25m classic motor yacht Perihan and he confirms that he acted for the seller with Charter Italy representing the buyer. Originally launched in 1974, Moritz says that she'll be going back to Italy to be fully restored as 'there's quite a lot of work to be done.' Moritz continues: "there's a definite niche market for these older classic yachts with good lines simply crying out to be restored to their former glory." Perihan has a large flybridge and offers accommodation for eight guests in four ensuite staterooms. 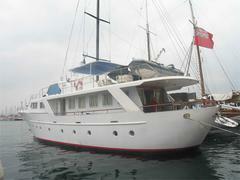 She was listed for sale asking €495,000.